Fasting is associated with numerous health benefits; from weight loss to longevity. There are many different types of fasting methods, such as intermittent fasting. The fasting mimicking diet allows you to experience the benefits of traditional fasting without depriving your body of food. 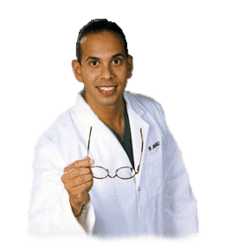 The main difference of the FMD is that instead of completely eliminating all food for several days or even weeks, you only restrict your calorie intake for five days out of the month. The FMD can be practiced once a month to promote well-being. While anyone can follow the FMD on their own, the ProLon® fasting mimicking diet offers a 5-day meal program which has been individually packed and labeled for each day and it serves the foods you need for the FMD in precise quantities and combinations. The meal program is made up of ready-to-eat or easy-to-prepare, plant-based foods, including bars, soups, snacks, supplements, a drink concentrate, and teas. The products are scientifically formulated and great tasting. Before starting the ProLon® fasting mimicking diet, 5-day meal program, please make sure to talk to a healthcare professional to find out if the FMD is right for you. The purpose of the research study below is to demonstrate the molecular mechanisms and clinical applications of fasting in the FMD. Fasting has been practiced for millennia, but only recently studies have shed light on its role in adaptive cellular responses that reduce oxidative damage and inflammation, optimize energy metabolism and bolster cellular protection. In lower eukaryotes, chronic fasting extends longevity in part by reprogramming metabolic and stress resistance pathways. In rodents intermittent or periodic fasting protects against diabetes, cancers, heart disease and neurodegeneration, while in humans it helps reduce obesity, hypertension, asthma and rheumatoid arthritis. Thus, fasting has the potential to delay aging and help prevent and treat diseases while minimizing the side effects caused by chronic dietary interventions. In humans, fasting is achieved by ingesting no or minimal amounts of food and caloric beverages for periods that typically range from 12 hours to three weeks. Many religious groups incorporate periods of fasting into their rituals including Muslims who fast from dawn until dusk during the month of Ramadan, and Christians, Jews, Buddhists and Hindus who traditionally fast on designated days of the week or calendar year. In many clinics, patients are now monitored by physicians while undergoing water only or very low calorie (less than 200 kcal/day) fasting periods lasting from 1 week or longer for weight management, and for disease prevention and treatment. Fasting is distinct from caloric restriction (CR) in which the daily caloric intake is reduced chronically by 20–40%, but meal frequency is maintained. Starvation is instead a chronic nutritional insufficiency that is commonly used as a substitute for the word fasting, particularly in lower eukaryotes, but that is also used to define extreme forms of fasting, which can result in degeneration and death. We now know that fasting results in ketogenesis, promotes potent changes in metabolic pathways and cellular processes such as stress resistance, lipolysis and autophagy, and can have medical applications that in some cases are as effective as those of approved drugs such as the dampening of seizures and seizure-associated brain damage and the amelioration of rheumatoid arthritis (Bruce-Keller et al., 1999; Hartman et al., 2012; Muller et al., 2001). As detailed in the remainder of this article, findings from well-controlled investigations in experimental animals, and emerging findings from human studies, indicate that different forms of fasting may provide effective strategies to reduce weight, delay aging, and optimize health. Here we review the fascinating and potent effects of different forms of fasting including intermittent fasting (IF, including alternate day fasting, or twice weekly fasting, for example) and periodic fasting (PF) lasting several days or longer every 2 or more weeks. We focus on fasting and minimize the discussion of CR, a topic reviewed elsewhere (Fontana et al., 2010; Masoro, 2005). The remarkable effects of the typical 20–40% CR on aging and diseases in mice and rats are often viewed as responses evolved in mammals to adapt to periods of limited availability of food (Fontana and Klein, 2007; Fontana et al., 2010; Masoro, 2005; Weindruch and Walford, 1988). However, the cellular and molecular mechanisms responsible for the protective effects of CR have likely evolved billions of years earlier in prokaryotes attempting to survive in an environment largely or completely devoid of energy sources while avoiding age-dependent damage that could compromise fitness. In fact, E. coli switched from a nutrient rich broth to a calorie-free medium survive 4 times longer, an effect reversed by the addition of various nutrients but not acetate, a carbon source associated with starvation conditions (Figure 1A) (Gonidakis et al., 2010). The effect of rich medium but not acetate in reducing longevity raises the possibility that a ketone body-like carbon source such as acetate may be part of an “alternate metabolic program” that evolved billions of years ago in microorganisms and that now allows mammals to survive during periods of food deprivation by obtaining much of the energy by catabolizing fatty acids and ketone bodies including acetoacetate and β-hydroxybutyrate (Cahill, 2006). In the yeast S. cerevisiae, switching cells from standard growth medium to water also causes a consistent 2-fold chronological lifespan extension as well as a major increase in the resistance to multiple stresses (Figure 1B) (Longo et al., 1997; Longo et al., 2012). The mechanisms of food deprivation-dependent lifespan extension involve the down-regulation of the amino acid response Tor-S6K (Sch9) pathway as well as of the glucose responsive Ras-adenylate cyclase-PKA pathway resulting in the activation of the serine/threonine kinase Rim15, a key enzyme coordinating the protective responses (Fontana et al., 2010). The inactivation of Tor-S6K, Ras-AC-PKA and activation of Rim15 result in increased transcription of genes including superoxide dismutases and heat shock proteins controlled by stress responsive transcription factors Msn2, Msn4 and Gis1, required for the majority of the protective effects caused by food deprivation (Wei et al., 2008). Notably, when switched to food deprivation conditions, both bacteria and yeast enter a hypometabolic mode that allows them to minimize the use of reserve carbon sources and can also accumulate high levels of the ketone body-like acetic acid, analogously to mammals. Another major model organism in which fasting extends lifespan is the nematode C. elegans. Food deprivation conditions achieved by feeding worms little or no bacteria, lead to a major increase in lifespan (Figure 1C) (Kaeberlein et al., 2006; Lee et al., 2006), which requires AMPK as well as the stress resistance transcription factor DAF-16, similarly to the role of transcription factors Msn2/4 and Gis1 in yeast and FOXOs in flies and mammals (Greer et al., 2007). Intermittent food deprivation also extends lifespan in C. elegans by a mechanism involving the small GTPase RHEB-1 (Honjoh et al., 2009). In flies, most studies indicate that intermittent food deprivation does not affect lifespan (Grandison et al., 2009). However, food reduction or food dilution have been consistently shown to extend Drosophila longevity (Piper and Partridge, 2007) suggesting that flies can benefit from dietary restriction but may be sensitive to even short starvation periods. Together these results indicate that food deprivation can result in pro-longevity effects in a wide variety of organisms, but also underline that different organisms have different responses to fasting. In most mammals, the liver serves as the main reservoir of glucose, which is stored in the form of glycogen. In humans, depending upon their level of physical activity, 12 to 24 hours of fasting typically results in a 20% or greater decrease in serum glucose and depletion of the hepatic glycogen, accompanied by a switch to a metabolic mode in which non-hepatic glucose, fat-derived ketone bodies and free fatty acids are used as energy sources (Figures 2 and 3). Whereas most tissues can utilize fatty acids for energy, during prolonged periods of fasting, the brain relies on the ketone bodies β-hydroxybutyrate and acetoacetate in addition to glucose for energy consumption (Figure 3B). Ketone bodies are produced in hepatocytes from the acetyl-CoA generated from β oxidation of fatty acids released into the bloodstream by adipocytes, and also by the conversion of ketogenic amino acids. After hepatic glycogen depletion, ketone bodies, fat-derived glycerol, and amino acids account for the gluconeogenesis-dependent generation of approximately 80 grams/day of glucose, which is mostly utilized by the brain. 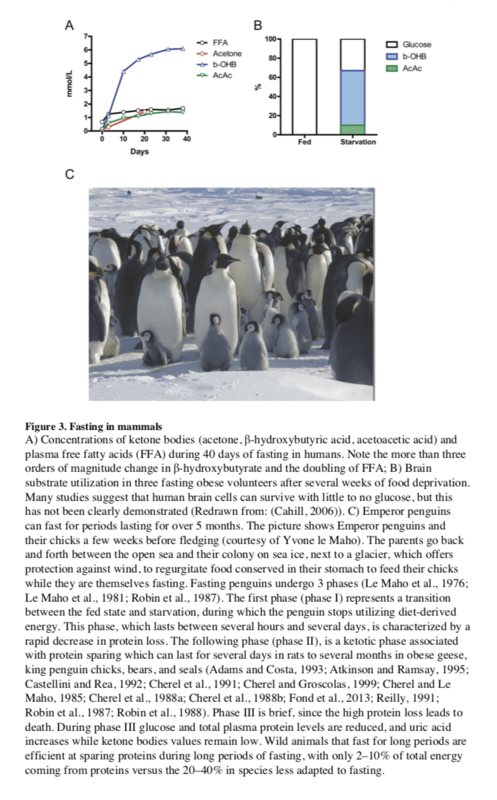 Depending on body weight and composition, the ketone bodies, free fatty acids and gluconeogenesis allow the majority of human beings to survive 30 or more days in the absence of any food and allow certain species, such as king penguins, to survive for over 5 months without food (Eichhorn et al., 2011) (Figure 3C). In humans, during prolonged fasting, the plasma levels of 3-β-hydroxybutyrate are about 5 times those of free fatty acids and acetoacetic acid (Figure 3A and 3B). The brain and other organs utilize ketone bodies in a process termed ketolysis, in which acetoacetic acid and 3-β- hydroxybutyrate are converted into acetoacetyl-CoA and then acetyl-CoA. 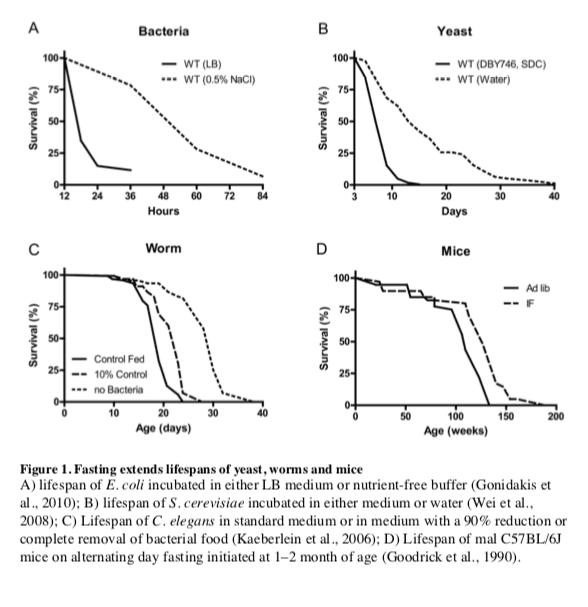 These metabolic adaptations to fasting in mammals are reminiscent of those described earlier for E. coli and yeast, in which acetic acid accumulates in response to food deprivation (Gonidakis et al., 2010; Longo et al., 2012). In yeast, glucose, acetic acid and ethanol, but not glycerol which is also generated during fasting from the breakdown of fats, accelerate aging (Fabrizio et al., 2005; Wei et al., 2009). Thus, glycerol functions as a carbon source that does not activate the pro-aging nutrient signaling pathways but can be catabolized by cells. It will be important to understand how the different carbon sources generated during fasting affect cellular protection and aging. and to determine whether glycerol, specific ketone bodies or fatty acids can provide nourishment while reducing cellular aging in mammals, a possibility suggested by beneficial effects of a dietary ketone precursor in a mouse model of Alzheimer’s disease (Kashiwaya et al., 2012). It will also be important to study, in various model organisms and humans, how high intake of specific types of fats (medium- vs. long- chain fatty acids, etc.) in substitution of carbohydrates and proteins influences gluconeogenesis and glucose levels as well as aging and diseases. In mammals, severe CR/food deprivation results in a decrease in the size of most organs except the brain, and the testicles in male mice (Weindruch and Sohal, 1997). From an evolutionary perspective this implies that maintenance of a high level of cognitive function under conditions of food scarcity is of preeminent importance. Indeed, a highly conserved behavioral trait of all mammals is to be active when hungry and sedentary when satiated. In rodents, alternating days of normal feeding and fasting (IF) can enhance brain function as indicated by improvements in performance on behavioral tests of sensory and motor function (Singh et al., 2012) and learning and memory (Fontan-Lozano et al., 2007). The behavioral responses to IF are associated with increased synaptic plasticity and increased production of new neurons from neural stem cells (Lee et al., 2002). Particularly interesting with regards to adaptive responses of the brain to limited food availability during human evolution is brain-derived neurotrophic factor (BDNF). The genes encoding BDNF and its receptor TrkB appeared in genomes relatively recently as they are present in vertebrates, but absent from worms, flies and lower species (Chao, 2000). The prominent roles of BDNF in the regulation of energy intake and expenditure in mammals is highlighted by the fact that the receptors for both BDNF and insulin are coupled to the highly conserved PI3 kinase – Akt, and MAP kinase signaling pathways (Figure 4). Studies of rats and mice have shown that running wheel exercise and IF increase BDNF expression in several regions of the brain, and that BDNF in part mediates exercise- and IF-induced enhancement of synaptic plasticity, neurogenesis and neuronal resistance to injury and disease (see sections on fasting and neurodegeneration below). 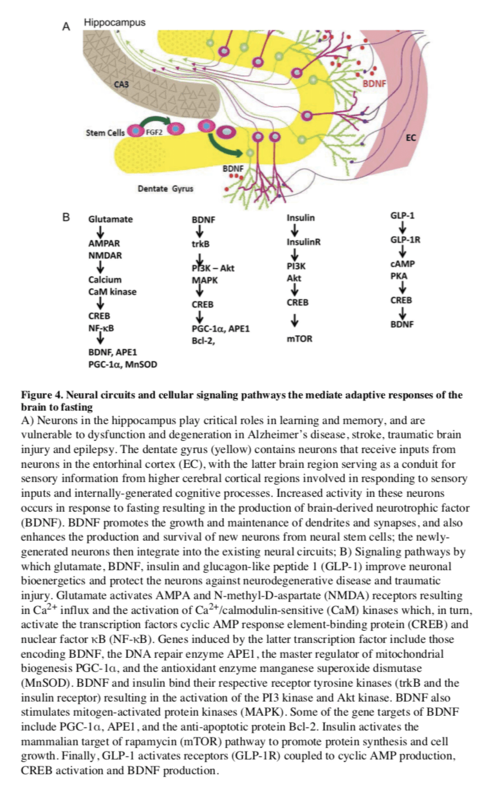 BDNF signaling in the brain may also mediate behavioral and metabolic responses to fasting and exercise including regulation of appetite, activity levels, peripheral glucose metabolism and autonomic control of the cardiovascular and gastrointestinal systems (Mattson, 2012a, b; Rothman et al., 2012). Hunger is an adaptive response to food deprivation that involves sensory, cognitive and neuroendocrine changes which motivate and enable food seeking behaviors. It has been proposed that hunger-related neuronal networks, neuropeptides and hormones play pivotal roles in the beneficial effects of energy restriction on aging and disease susceptibility. As evidence, when mice in which the hypothalamic ‘hunger peptide’ NPY is selectively ablated are maintained on a CR diet, the ability of CR to suppress tumor growth is abolished (Shi et al., 2012). The latter study further showed that the ability of CR to elevate circulating adiponectin levels was also compromised in NPY-deficient mice, suggesting a key role for the central hunger response in peripheral endocrine adaptations to energy restriction. Adiponectin levels increase dramatically in response to fasting; and data suggest roles for adiponectin in the beneficial effects of IF on the cardiovascular system (Wan et al., 2010). The hunger response may also improve immune function during aging as ghrelin-deficient mice exhibit accelerated thymic involution during aging, and treatment of middle age mice with ghrelin increases thymocyte numbers and improves the functional diversity of peripheral T cell subsets (Peng et al., 2012). In addition to its actions on the hypothalamus and peripheral endocrine cells, fasting may increase neuronal network activity in brain regions involved in cognition, resulting in the production of BDNF, enhanced synaptic plasticity and improved stress tolerance (Rothman et al., 2012). Thus, hunger may be a critical factor involved in widespread central and peripheral adaptive responses to the challenge of food deprivation for extended time periods. The major differences between IF and PF in mice are the length and the frequency of the fast cycles. IF cycles usually last 24 hours and are one to a few days apart, whereas PF cycles last 2 or more days and are at least 1 week apart, which is necessary for mice to regain their normal weight. One difference in the molecular changes caused by different fasting regimes is the effect on a variety of growth factors and metabolic markers, with IF causing more frequent but less pronounced changes than PF. It will be important to determine how the frequency of specific changes such as the lowering of IGF-1 and glucose affect cellular protection, diseases and longevity. The most extensively investigated IF method in animal studies of aging has been alternate day fasting (food is withdrawn for 24 hours on alternate days, with water provided ad libitum) (Varady and Hellerstein, 2007). The magnitude of the effects of alternate day fasting on longevity in rodents depends upon the species and age at regimen initiation, and can range from a negative effect to as much as an 80% lifespan extension (Arum et al., 2009; Goodrick et al., 1990). IF every other day extended the lifespan of rats more than fasting every 3rd or 4th day (Carlson and Hoelzel, 1946). Fasting for 24 hours twice weekly throughout adult life resulted in a significant increase in lifespan of black-hooded rats (Kendrick, 1973). In rats, the combination of alternate day fasting and treadmill exercise resulted in greater maintenance of muscle mass than did IF or exercise alone (Sakamoto and Grunewald, 1987). Interestingly, when rats were maintained for 10 weeks on a PF diet in which they fasted 3 consecutive days each week, they were less prone to hypoglycemia during 2 hours of strenuous swimming exercise as a result of their accumulation of larger intramuscular stores of glycogen and triglycerides (Favier and Koubi, 1988). Several major physiological responses to fasting are similar to those caused by regular aerobic exercise including increased insulin sensitivity and cellular stress resistance, reduced resting blood pressure and heart rate, and increased heart rate variability as a result of increased parasympathetic tone (Figure 2) (Anson et al., 2003; Mager et al., 2006; Wan et al., 2003). Emerging findings suggest that exercise and IF retard aging and some age-related diseases by shared mechanisms involving improved cellular stress adaptation (Stranahan and Mattson, 2012). However, in two different mouse genetic backgrounds, IF did not extend mean lifespan and even reduced lifespan when initiated at 10 months (Goodrick et al., 1990). When initiated at 1.5 months, IF either increased longevity or had no effect (Figure 1D) (Goodrick et al., 1990). These results in rodents point to conserved effects of fasting on lifespan, but also to the need for a much better understanding of the type of fasting that can maximize its longevity effects and the mechanisms responsible for the detrimental effects that may be counterbalancing its anti-aging effects. For example, one possibility is that fasting may be consistently protective in young and middle aged laboratory rodents that are either gaining or maintaining a body weight, but may be detrimental in older animals that, similarly to humans, begin to lose weight prior to their death. Notably, whereas bacteria, yeast and humans can survive for several weeks or more without nutrients, most strains of mice are unable to survive more than 3 days without food. The age-dependent weight loss may make this sensitivity to long periods of fasting worse. Fasting can have positive effects in cancer prevention and treatment. In mice, alternate day fasting caused a major reduction in the incidence of lymphomas (Descamps et al., 2005) and fasting for 1 day per week delayed spontaneous tumorigenesis in p53-deficient mice (Berrigan et al., 2002). However, the major decrease in glucose, insulin and IGF-1 caused by fasting, which is accompanied by cell death and/or atrophy in a wide range of tissues and organs including the liver and kidneys, is followed by a period of abnormally high cellular proliferation in these tissues driven in part by the replenishment of growth factors during refeeding. When combined with carcinogens during refeeding, this increased proliferative activity can actually increase carcinogenesis and/or pre-cancerous lesions in tissues including liver and colon (Tessitore et al., 1996). Although these studies underline the need for an in depth understanding of its mechanisms of action, fasting is expected to have cancer preventive effects as indicated by the studies above and by the findings that multiple cycles of periodic fasting can be as effective as toxic chemotherapy in the treatment of some cancers in mice (Lee et al., 2012). In the treatment of cancer, fasting has been shown to have more consistent and positive effects. PF for 2–3 days was shown to protect mice from a variety of chemotherapy drugs, an effect called differential stress resistance (DSR) to reflect the inability of cancer cells to become protected based on the role of oncogenes in negatively regulating stress resistance, thus rendering cancer cells, by definition, unable to become protected in response to fasting conditions (Figure 5) (Raffaghello et al., 2008). PF also causes a major sensitization of various cancer cells to chemo-treatment, since it fosters an extreme environment in combination with the stress conditions caused by chemotherapy. 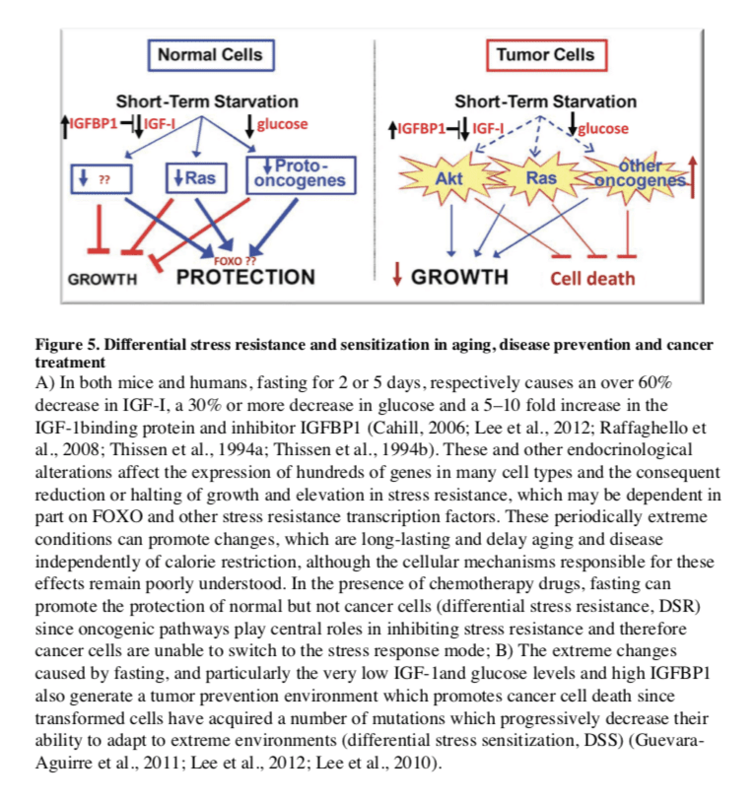 In contrast to the protected state entered by normal cells during fasting, cancer cells are unable to adapt, a phenomenon called differential stress sensitization (DSS), based on the notion that most mutations are deleterious and that the many mutations accumulated in cancer cells promote growth under standard conditions but render them much less effective in adapting to extreme environments (Lee et al., 2012). In mouse models of metastatic tumors, combinations of fasting and chemotherapy that cause DSR and DSS, result in 20 to 60% cancer-free survival compared to the same levels of chemotherapy or fasting alone, which are not sufficient to cause any cancer-free survival (Lee et al., 2012; Shi et al., 2012). Thus, the idea that cancer could be treated with weeks of fasting alone, made popular decades ago, may be only partially true, at least for some type of cancers, but is expected to be ineffective for other types of cancers. The efficacy of long-term fasting alone (2 weeks or longer) in cancer treatment will need to be tested in carefully designed clinical trials in which side effects including malnourishment and possibly a weakened immune system and increased susceptibility to certain infections are carefully monitored. By contrast, animal data from multiple laboratories indicate that the combination of fasting cycles with chemotherapy is highly and consistently effective in enhancing chemotherapeutic index and has high translation potential. A number of ongoing trials should soon begin to determine the efficacy of fasting in enhancing cancer treatment in the clinic. Compared to ad libitum-fed controls, rats and mice maintained on an IF diet exhibit less neuronal dysfunction and degeneration, and fewer clinical symptoms in models of Alzheimer’s disease (AD), Parkinson’s disease (PD) and Huntington’s disease (HD). These models include transgenic mice expressing mutant human genes that cause dominantly inherited AD (amyloid precursor protein and presenilin-1) and frontotemporal lobe dementia (Tau) (Halagappa et al., 2007), PD (α-synuclein) (Griffioen et al., 2012) and HD (huntingtin) (Duan et al., 2003), as well as neurotoxin-based models pertinent to AD, PD and HD (Bruce-Keller et al., 1999; Duan and Mattson, 1999). Animals on an IF diet also fare better than ad libitum-fed controls after acute injury including severe epileptic seizures, stroke, and traumatic brain and spinal cord injuries (Arumugam et al., 2010; Bruce-Keller et al., 1999; Plunet et al., 2008). Several interrelated cellular mechanisms contribute to the beneficial effects of IF on the nervous system including reduced accumulation of oxidatively damaged molecules, improved cellular bioenergetics, enhanced neurotrophic factor signaling, and reduced inflammation (Mattson, 2012a). The latter neuroprotective mechanisms are supported by studies showing that IF diets boost levels of antioxidant defenses, neurotrophic factors (BDNF and FGF2) and protein chaperones (HSP-70 and GRP-78), and reduce levels of pro- inflammatory cytokines (TNFα, IL-1β and IL-6) (Figure 4) (Arumugam et al., 2010). IF may also promote restoration of damaged nerve cell circuits by stimulating synapse formation and the production of new neurons from neural stem cells (neurogenesis) (Lee et al., 2002). Interestingly, while beneficial in models of most neurodegenerative conditions, there is evidence that fasting can hasten neurodegeneration in some models of inherited amyotrophic lateral sclerosis, perhaps because the motor neurons affected in those models are unable to respond adaptively to the moderate stress imposed by fasting (Mattson et al., 2007; Pedersen and Mattson, 1999). Metabolic syndrome (MS), defined as abdominal adiposity, combined with insulin resistance, elevated triglycerides and/or hypertension, greatly increases the risk of cardiovascular disease, diabetes, stroke and AD. Rats and mice maintained under the usual ad libitum feeding condition develop an MS-like phenotype as they age. MS can also be induced in younger animals by feeding them a diet high in fat and simple sugars (Martin et al., 2010). IF can prevent and reverse all aspects of the MS in rodents: abdominal fat, inflammation and blood pressure are reduced, insulin sensitivity is increased, and the functional capacities of the nervous, neuromuscular and cardiovascular systems are improved (Castello et al., 2010; Wan et al., 2003). Hyperglycemia is ameliorated by IF in rodent models of diabetes (Pedersen et al., 1999) and the heart is protected against ischemic injury in myocardial infarction models (Ahmet et al., 2005). A protective effect of fasting against ischemic renal and liver injury occurs rapidly, with 1 – 3 days of fasting improving functional outcome and reducing tissue injury and mortality (Mitchell et al., 2010). Six days on a diet missing just a single essential amino acid such as tryptophan can also elicit changes in metabolism and stress resistance, similar to those caused by fasting, which are dependent on the amino acid sensing kinase Gcn2 (Peng et al., 2012). Multiple hormonal changes that typify MS in humans a re observed in rodents maintained on high fat and sugar diets including elevated levels of insulin and leptin and reduced levels of adiponectin and ghrelin. Elevated leptin levels are typically reflective of a pro- inflammatory state, whereas adiponectin and ghrelin can suppress inflammation and increase insulin sensitivity (Baatar et al., 2011; Yamauchi et al., 2001). 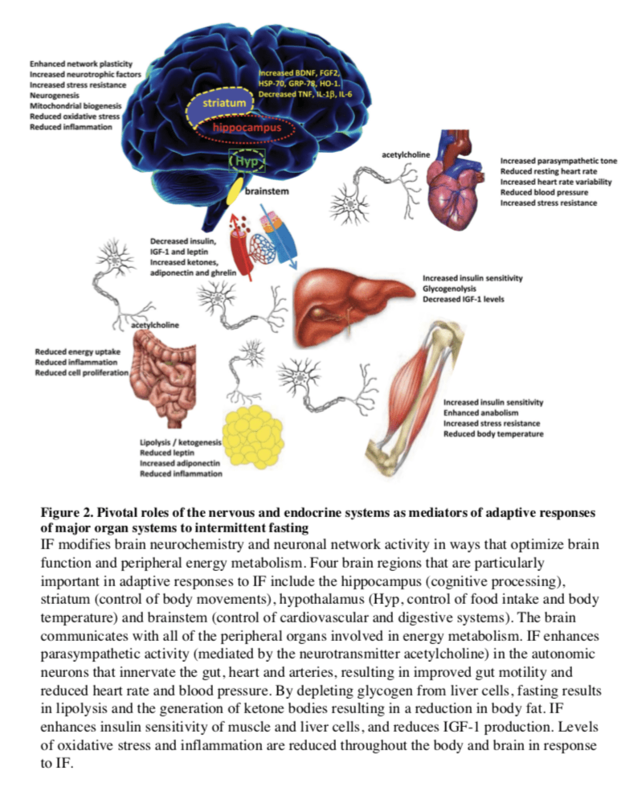 Local inflammation in hypothalamic nuclei that control energy intake and expenditure may contribute to a sustained positive energy balance in MS (Milanski et al., 2012). Fasting results in a lowering of insulin and leptin levels and an elevation of adiponectin and ghrelin levels. By increasing insulin and leptin sensitivity, suppressing inflammation and stimulating autophagy, fasting reverses all the major abnormalities of the MS in rodents (Singh et al., 2009; Wan et al., 2010). Finally, in addition to its many effects on cells throughout the body and brain, IF may elicit changes in the gut microbiota that protect against MS (Tremaroli and Backhed, 2012). Naturally, the challenge of applying fasting-based interventions to treat MS in humans is a major one, as some obese individuals may have difficulties in following IF for long periods. The ProLon® fasting mimicking diet is a 5-day meal program consisting of scientifically developed and clinically tested, natural ingredients which "trick" the human body into a fasting mode. The FMD is low in carbohydrates as well as proteins and it's high in fats. 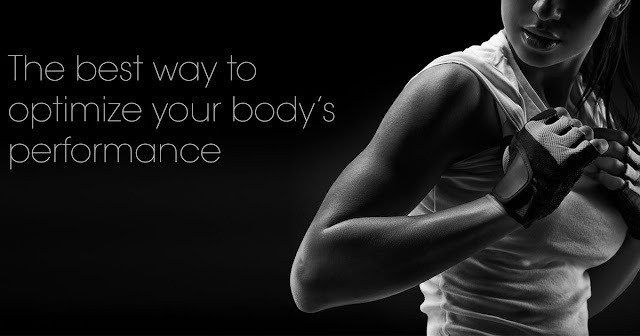 The ProLon® fasting mimicking diet promotes a variety of healthy benefits, including weight loss and decreased abdominal fat, all while preserving lead body mass, improved energy levels, softer and healthier looking skin, as well as overall health and wellness. The FMD can promote longevity. Clinical and epidemiological data are consistent wit h an ability of fasting to retard the aging process and associated diseases. Major factors implicated in aging whose generation are accelerated by gluttonous lifestyles and slowed by energy restriction in humans include: 1) oxidative damage to proteins, DNA and lipids; 2) inflammation; 3) accumulation of dysfunctional proteins and organelles; and 4) elevated glucose, insulin and IGF-I, although IGF-1decreases with aging and its severe deficiency can be associated with certain pathologies (Bishop et al., 2010; Fontana and Klein, 2007). Serum markers of oxidative damage and inflammation as well as clinical symptoms are reduced over a period of 2–4 weeks in asthma patients maintained on an alternate day fasting diet (Johnson et al., 2007). Similarly, when on a 2 days/week fasting diet overweight women at risk for breast cancer exhibited reduced oxidative stress and inflammation (Harvie et al., 2011) and elderly men exhibited reductions in body weight and body fat, and improved mood (Teng et al., 2011). Additional effects of fasting in human cells that can be considered as potentially ‘anti-aging’ are inhibition the mTOR pathway, stimulation of autophagy and ketogenesis (Harvie et al., 2011; Sengupta et al., 2010). Among the major effects of fasting relevant to aging and diseases are changes in the levels of IGF-1, IGFBP1, glucose, and insulin. Fasting for 3 or more days causes a 30% or more decrease in circulating insulin and glucose, as well as rapid decline in the levels of insulin- like growth factor 1 (IGF-1), the major growth factor in mammals, which together with insulin is associated with accelerated aging and cancer (Fontana et al., 2010). In humans, five days of fasting causes an over 60% decrease in IGF-1and a 5-fold or higher increase in one of the principal IGF-1-inhibiting proteins: IGFBP1 (Thissen et al., 1994a). This effect of fasting on IGF-1is mostly due to protein restriction, and particularly to the restriction of essential amino acids, but is also supported by calorie restriction since the decrease in insulin levels during fasting promotes reduction in IGF-1(Thissen et al., 1994a). Notably, in humans, chronic calorie restriction does not lead to a decrease in IGF-1unless combined with protein restriction (Fontana et al., 2008). IF can be achieved in with a minimal decrease in overall calorie intake if the refeeding period in which subjects overeat is considered. Thus, fasting cycles provide a much more feasible strategy to achieve the beneficial effects of CR, and possibly stronger effects, without the burden of chronic underfeeding and some of the potentially adverse effects associated with weight loss or very low BMIs. In fact, subjects who are moderately overweight (BMI of 25–30) in later life can have reduced overall mortality risk compared to subjects of normal weight (Flegal et al., 2013). Although these results may be affected by the presence of many existing or developing pathologies in the low weight control group, they underline the necessity to differentiate between young individuals and elderly individuals who may use CR or fasting to reduce weight or delay aging. Although extreme dietary interventions during old age may continue to protect from age-related diseases, they could have detrimental effects on the immune system and the ability to respond to certain infectious diseases, wounds and other challenges (Kristan, 2008; Reed et al., 1996). However, IF or PF designed to avoid weight loss and maximize nourishment have the potential to have beneficial effects on infectious diseases, wounds and other insults even in the very old. Nourishment of subjects can be achieved by complementing IF or PF with micro- and macro Studies to test the effect of IF or PF regimens on markers of aging, cancer, cognition and obesity are in progress (V. Longo and M. Mattson). Fasting has the potential for applications in both cancer prevention and treatment. Although no human data are available on the effect of IF or PF in cancer prevention, their effect on reducing IGF-1, insulin and glucose levels, and increasing IGFBP1 and ketone body levels could generate a protective environment that reduces DNA damage and carcinogenesis, while at the same time creating hostile conditions for tumor and pre-cancerous cells (Figure 5). In fact, elevated circulating IGF-1 is associated with increased risk of developing certain cancers (Chan et al., 2000; Giovannucci et al., 2000) and individuals with severe IGF-1deficiency caused by growth hormone receptor deficiency, rarely develop cancer (Guevara-Aguirre et al., 2011; Shevah and Laron, 2007; Steuerman et al., 2011). Furthermore, the serum from these IGF-1deficient subjects protected human epithelial cells from oxidative stress-induced DNA damage. Furthermore, once their DNA became damaged, cells were more likely to undergo programmed cell death (Guevara-Aguirre et al., 2011). Thus, fasting may protect from cancer by reducing cellular and DNA damage but also by enhancing the death of pre-cancerous cells. In a preliminary study of 10 subjects with a variety of malignancies, the combination of chemotherapy with fasting resulted in a decrease in a range of self-reported common side effects caused by chemotherapy compared to the same subjects receiving chemotherapy while on a standard diet (Safdie et al., 2009). The effect of fasting on chemotherapy toxicity and cancer progression is now being tested in clinical trials in both Europe and the US (0S-08-9, 0S-10-3). Our current understanding of the impact of IF on the nervous system and cognitive functions is largely inferred from animal studies (see above). Interventional studies to determine the impact of fasting on brain function and neurodegenerative disease processes are lacking. After 3–4 month, CR improved cognitive function (verbal memory) in overweight women (Kretsch et al., 1997) and in elderly subjects (Witte et al., 2009). Similarly, when subjects with mild cognitive impairment were maintained for 1 month on a low glycemic diet, they exhibited improved delayed visual memory, cerebrospinal fluid biomarkers of Aβ metabolism and brain bioenergetics (Bayer-Carter et al., 2011). Studies in which cognitive function, regional brain volumes, neural network activity, and biochemical analyses of cerebrospinal fluid are measured in human subjects before and during an extended period of IF should clarify the impact of IF on human brain structure and function. In humans, one of the best demonstrations of the beneficial effects of long-term fasting lasting one to 3 weeks is in the treatment of rheumatoid arthritis (RA). In agreement with the results in rodents, there is little doubt that during the period of fasting both inflammation and pain are reduced in RA patients (Muller et al., 2001). However, after the normal diet is resumed, inflammation returns unless the fasting period is followed by a vegetarian diet (Kjeldsen-Kragh et al., 1991), a combination therapy that has beneficial effects lasting for two years or longer (Kjeldsen-Kragh et al., 1994). The validity of this approach is supported by four differently controlled studies, including two randomized trials (Muller et al., 2001). Therefore, fasting combined with a vegetarian diet and possibly with other modified diets provides beneficial effects in the treatment of RA. Alternate day IF also resulted in significant reductions in serum TNFα and ceramides in asthma patients during a 2 month period (Johnson et al., 2007). The latter study further showed that markers of oxidative stress often associated with inflammation (protein and lipid oxidation) were significantly reduced in response to IF. Thus, for many patients able and willing to endure long-term fasting and to permanently modify their diet, fasting cycles would have the potential to not only augment but also replace existing medical treatments. Water only and other forms of long-term fasting have also been documented to have potent effects on hypertension. An average of 13 days of water only fasting resulted in the achievement of a systolic blood pressure (BP) below 120 in 82% of subjects with borderline hypertension with a mean 20 mm Hg reduction in BP (Goldhamer et al., 2002). BP remained significantly lower compared to baseline even after subjects resumed the normal diet for an average of 6 days (Goldhamer et al., 2002). A small pilot study of patients with hypertension (140 mm and above systolic BP) also showed that 10–11 days of fasting caused a 37–60 mm decrease in systolic BP (Goldhamer et al., 2001). These preliminary studies are promising but underscore the need for larger controlled and randomized clinical studies that focus on periodic fasting strategies that are feasible for a larger portion of the population. For both hypertension and RA it will be important to develop PF mimicking diets that are as effective as the fasting regimens described above but that are also tolerable by the great majority of patients. Periodic fasting can reverse multiple features of the metabolic syndrome in humans: it enhances insulin sensitivity, stimulates lipolysis and reduces blood pressure. Body fat and blood pressure were reduced and glucose metabolism improved in obese subjects in response to an alternate day modified fast (Klempel et al., 2013; Varady et al., 2009). Overweight subjects maintained for 6 months on a twice weekly IF diet in which they consumed only 500–600 calories on the fasting days, lost abdominal fat, displayed improved insulin sensitivity and reduced blood pressure (Harvie et al., 2011). Three weeks of alternate day fasting resulted in reductions in body fat and insulin levels in normal weight men and women (Heilbronn et al., 2005) and Ramadan fasting (2 meals/day separated by approximately 12 hours) in subjects with MS resulted in decreased daily energy intake, decreased plasma glucose levels and increased insulin sensitivity (Shariatpanahi et al., 2008). Subjects undergoing coronary angiography who reported that they fasted regularly exhibited a lower prevalence of diabetes compared to non-fasters (Horne et al., 2012). Anti- metabolic syndrome effects of IF were also observed in healthy young men (BMI of 25) after 15 days of alternate day fasting: their whole-body glucose uptake rates increased significantly, levels of plasma ketone bodies and adiponectin were elevated, all of which occurred without a significant decrease in body weight (Halberg et al., 2005). The latter findings are similar to data from animal studies showing that IF can improve glucose metabolism even with little or no weight change (Anson et al., 2003). It will be important to determine if longer fasting periods which promote a robust switch to a fat breakdown and ketone body-based metabolism, can cause longer lasting and more potent effects. Based on the existing evidence from animal and human studies described, we conclude that there is great potential for lifestyles that incorporate periodic fasting during adult life to promote optimal health and reduce the risk of many chronic diseases, particularly for those who are overweight and sedentary. Animal studies have documented robust and replicable effects of fasting on health indicators including greater insulin sensitivity, and reduced levels of blood pressure, body fat, IGF-I, insulin, glucose, atherogenic lipids and inflammation. Fasting regimens can ameliorate disease processes and improve functional outcome in animal models of disorders that include myocardial infarction, diabetes, stroke, AD and PD. One general mechanism of action of fasting is that it triggers adaptive cellular stress responses, which result in an enhanced ability to cope with more severe stress and counteract disease processes. In addition, by protecting cells from DNA damage, suppressing cell growth and enhancing apoptosis of damaged cells, fasting could retard and/ or prevent the formation and growth of cancers. However, studies of fasting regimens have not been performed in children, the very old and underweight individuals, and it is possible that IF and PF would be harmful to these populations. Fasting periods lasting longer than 24 hours and particularly those lasting 3 or more days should be done under the supervision of a physician and preferably in a clinic. IF- and PF-based approaches towards combating the current epidemics of overweight, diabetes and related diseases should be pursued in human research studies and medical treatment plans. Several variations of potential ‘fasting prescriptions’ that have been adopted for overweight subjects revolve around the common theme of abstaining from food and caloric beverages for at least 12 – 24 hours on one or more days each week or month, depending on the length, combined with regular exercise. For those who are overweight, physicians could ask their patients to choose a fasting-based intervention that they believe they could comply with based upon their daily and weekly schedules. Examples include the ‘5:2’ IF diet (Harvie et al., 2011), the alternate day modified fasting diet (Johnson et al., 2007; Varady et al., 2009), a 4–5 day fast or low calorie but high nourishment fasting mimicking diets once every 1–3 months followed by the skipping of one major meal every day if needed (V. Longo, clinical trial in progress). One of the concerns with unbalanced alternating diets such as those in which low calorie intake is only observed for 2 days a week are the potential effects on circadian rhythm and the endocrine and gastrointestinal systems, which are known to be influenced by eating habits. During the first 4 – 6 weeks of implementation of the fasting regimen, a physician or registered dietitian should be in regular contact with the patient to monitor their progress and to provide advice and supervision. Fasting regimens could also be tailored for specific diseases as stand-alone or adjunct therapies. Results of initial trials of IF (fasting 2 days per week or every other day) in human subjects suggest that there is a critical transition period of 3 – 6 weeks during which time the brain and body adapt to the new eating pattern and mood is enhanced (Harvie et al., 2011; Johnson et al., 2007). Though speculative, it is likely that during the latter transition period brain neurochemistry changes so that the ‘addiction’ to regular consumption of food throughout the day is overcome. Notably, the various fasting approaches are likely to have limited efficacy particularly on aging and conditions other than obesity unless combined with diets such as the moderate calorie intake and mostly plant-based Mediterranean or Okinawa low protein diets (0.8 g protein/Kg of body weight), consistently associated with health and longevity. In the future, it will be important to combine epidemiological data, studies of long-lived populations and their diets, results from model organisms connecting specific dietary components to pro-aging and pro-disease factors, with data from studies on fasting regimens in humans, to design large clinical studies that integrate fasting with diets recognized as protective and enjoyable. A better understanding of the molecular mechanisms by which fasting affects various cell types and organ systems should lead to the development of novel prophylactic and therapeutic interventions for a wide range of disorders. The fasting mimicking diet provides the same benefits of traditional fasting by restricting your calorie intake for five days out of the month instead of completely eliminating all food for several days or even weeks. The ProLon® fasting mimicking diet offers a 5-day meal program which has been individually packed and labeled in precise quantities and combinations for each day. Although the research study above has demonstrated the health benefits of fasting, please make sure to talk to a healthcare professional before starting the ProLon® fasting mimicking diet, 5-day meal program to find out if the FMD, or any other diet, is right for you. The published, final edited form of the research study referenced above was made available in the NIH Public Access Author Manuscript on PMC February 4, 2015. 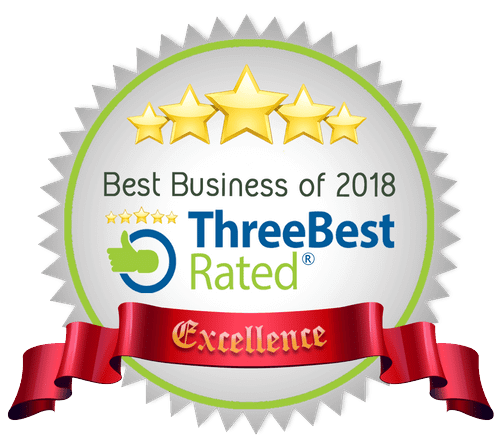 The scope of our information is limited to chiropractic, spinal health issues, and functional medicine topics. 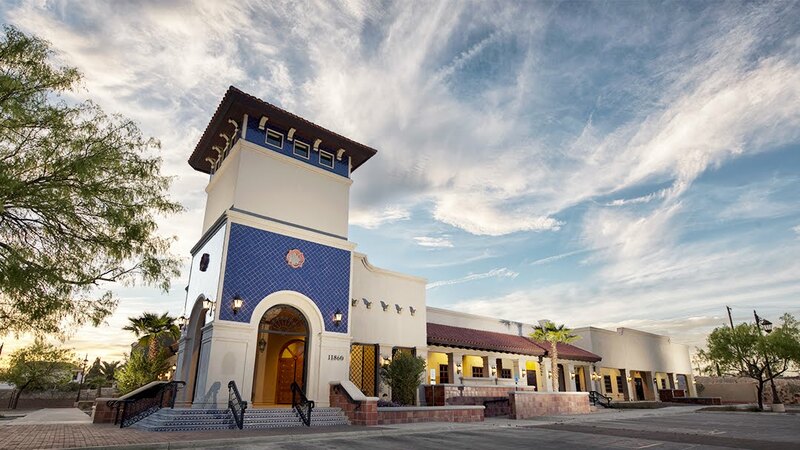 To further discuss the subject matter, please feel free to ask Dr. Alex Jimenez or contact us at 915-850-0900 .